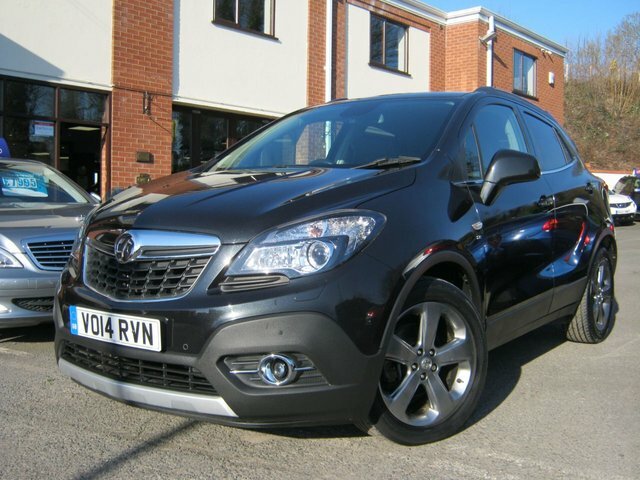 This lovely 1 owner 2014 14-Reg Vauxhall Mokka 1.6 SE has covered just 50,000 miles from new and comes with FSH, it has a big spec with extras including full black leather sports trim,cruise control,climate control,heated seats AND steering wheel! ,auto lights and wipers,Xenon headlamps,folding exterior mirrors,front and rear parking sensors, USB/Aux interface and anthracite alloy wheels,superb condion and fitted with nice normal 1600cc petrol engine!! Featuring smooth curves and a rugged stance, the Vauxhall Mokka is an attractive small SUV that offers low running costs and a responsive range of engines. The elevated driving position provides an excellent view of the road ahead, while passengers are free to relax and settle in for the ride. You'll find the very best deals on used Vauxhall Mokka cars for sale in Worcester right here at BJH Motors and Sons. Take the opportunity to browse our current stock here on the website and don't hesitate to contact a member of the showroom team when you're ready to arrange a test drive. We'll go the extra mile to ensure you find the right used car to suit your needs.